Members of the Detroit Coalition Against Police Brutality, Black Lives Matter Detroit, the Moratorium Now! 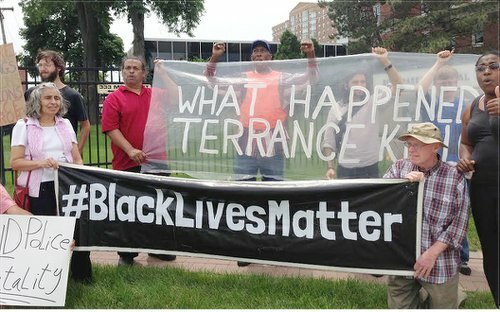 Coalition, Michigan United and Washtenaw to Ferguson demonstrated on June 26 to demand full transparency in the fatal shooting of 20-year-old Terrance Kellom. Kellom was killed on April 27 by Mitchell Quinn, an agent of Immigration and Customs Enforcement, who was part of a federal fugitive task force. The force entered Kellom’s home to apprehend him for an alleged armed robbery of a pizza parlor. Quinn’s excuse is that Kellom was wielding a hammer, an allegation his family denies. The Kellom family lawyer claims the youth was shot several times, including once in the back. Community and family members want answers; they want to see the results of the Detroit police investigation and the autopsy report, which has been sealed. For now, ICE refuses to release its report on Kellom’s death. In all likelihood there is collusion between all of these parties to construct a cover-up in another racist killing by the state. The murder of Kellom is one of three police killings in Detroit this year. In addition, on June 24 two Black children were killed when a suspect lost control of his vehicle during a high-speed police chase. The June 26 protest was held outside the offices of ICE. Demonstrators called for “no more killings, no more raids” by ICE targeting immigrants and resulting in deportations as well for the killing of Kellom and others. ICE was involved in the 2010 slaughter of Imam Luqman Ameen Abdullah, who was shot 20 times by federal agents. When his body was recovered, he was handcuffed.